During the summer months I went to see 10 drawings on display by Leonardo da Vinci at the Ulster Museum. I love art and didn’t want to miss this unique opportunity. It’s not every day that you get to see art like this on your doorstep. To mark the Diamond Jubilee of Her Majesty The Queen, ten of Leonardo da Vinci’s finest drawings in the Royal Collection have been on tour across the UK. Preserved from the 1500’s they have been selected to reflect Leonardo’s use of different media and the extraordinary range of his activities. This artists creativity was extraodinary and his ability to draw so many diverse pictures, with themes and such detail locked into them was pretty amazing to see. Leonardo enjoyed painting and sculpture, engineering, botany, mapmaking, hydraulics and anatomy. He even had a flare for fashion design. 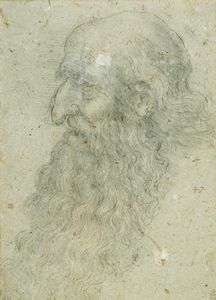 and a rough study of an old man with a beard in profile believed to be one the last drawings made by Leonardo and prehaps a self-portrait. This very unique collection of drawings was on display in Belfast until the 27th of August at the Ulster Museum. It was worth standing and waiting in a queue to get a glimpse of this artistic display.